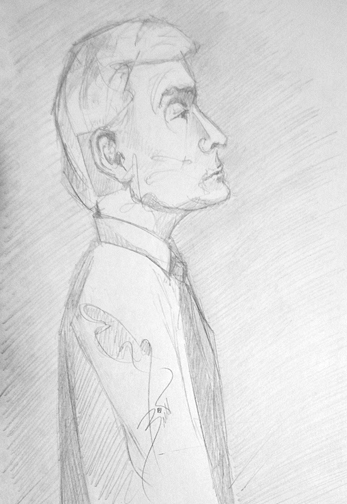 So the other day I attempted to draw my husband from across the room at The Corner Bakery. He was a very reluctant model. Fortunately I was so far away I couldn’t quite decipher whether I was getting the evil eye or not. LOL. So I’ve moved on to other unsuspecting people. Tonight I headed back over to my favorite Bakery and found this man waiting for a carry out order. I was lucky enough to whip this out. It’s not great but it’s getting there. I can’t wait until I can really sit down and do a full cafe drawing. That will be this Winter.